As many Apex developers are aware, there is a limitation on the number of columns in a compound primary key when creating forms out of the box. This was alleviated in 4.1 by the ability to use ROWID to identify the record. I gave some suggestions, but didn't have the opportunity to investigate at the time. Of course, I was really curious so I gave it a go myself when I had a chance - so here goes. 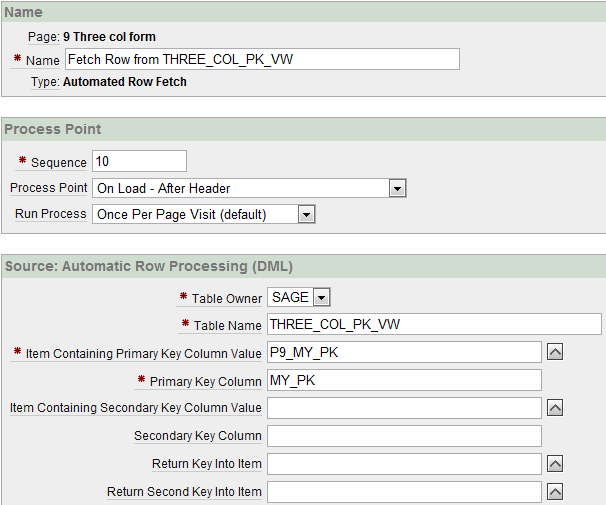 First I defined and populated a simple table with a primary key containing three columns. So to get around this problem, the first thing that came to mind was to create a view that contained the rowid and build a Report/Form combination on that. I figured there'd be a few problems arising from this, but one must start. When I saw this I thought - does the automatic row update also update the primary key? I have been curious about this in the past so I thought good a time as any to test it out. Tangent - for players of the PL/SQL Challenge, this was a topic of a recent quiz. 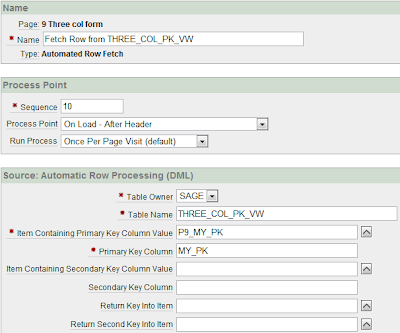 To determine if Apex includes the primary key in the update within the Automatic Row Processing - I created an even simpler table with a primary key and a before update trigger that only fired when the primary key column was updated. I needed some way of identifying if the trigger fired. I've always found the idea of mutating tables funny, so I thought I'd just attempt to insert into the triggering table. A merge would probably be more appropriate, but I have an issue with merge - for another blog post. And I couldn't be bothered working it out when this rolls off the fingers. I was wondering whether you considered creating "instead of" triggers on the view. This way you could keep your automatic row processing process and APEX would still do all the concurrent update checking. You can then control how the data is saved in the trigger, i.e. ignoring your rowid column and any others that might be read only etc. I haven't tested this so I'm not sure, but it was just a thought after reading your post. P.S. Sorry to hear about your mate. Instead of triggers offered a very flexible solution for tabular forms in APEX until 3.2. But from 4.1 you need to have a have a key-preserved table joined in your view to make it work. Have a look at my (slightly outdated) post on "Tabular Forms on Complex Views - using INSTEAD OF Triggers".